"A comprehensive and compassionate account of the intersections of jazz, race, and drugs in 20th-century America...A textured story of human hope and hopelessness, of artistry that blossomed in the most daunting and, in some cases, demeaning circumstances." [Torgoff] follows the birth of jazz in New Orleans, its development as the original soundtrack for drop-offs and underworld underlings, and its eventual progeny, the Beat generation." "Martin Torgoff's Bop Apocalypse excavates the origins of the great American youth revolt that Allen Ginsberg called the "bop apocalypse"--the musical, literary, sexual and narcotic experiments of the 1940s and early 1950s......Torgoff has an aficionado’s knowledge of music and drugs. Sober after years of reckless living, he writes well about the price of mixing them..."
"Torgoff is a brilliant writer; blending detailed music biography with cultural analysis to explore the folk devils and moral panics of the bebop era. His research is phenomenal, with an extensive bibliography and an impressive cast of interviewees..."
"This is an astutely reported and compellingly written examination of the genesis of the drug culture in American life. Torgoff cuts between scenes with the skill of a consummate filmmaker... A sometimes harrowing but essential read." "This exuberant appreciation, made luridly entertaining by all of the intoxicants, captures the wild energy and fertility of these seminal movements." "Fascinating: a highly coherent, comprehensive, and fully compelling account of the fusion of jazz, the igniting influence of drugs, and the emergence of the Beats. Torgoff is a terrific storyteller and relies on authoritative sources skillfully." 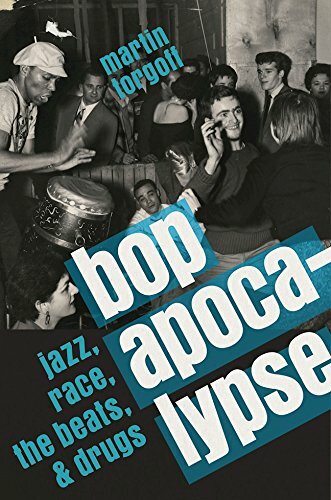 ..."a fabulous book--any reader will enjoy Bop Apocalypse, even if they know nothing about bebop or the Beat Generation. ..a valuable new interpretation of the roots of contemporary culture, and best of all, it is a pleasure to read." "There are a lot of tales to tell and Torgoff does a masterful job of telling them." "The debate on the legalization of drugs in America continues and heats up but nobody seems to have a clear idea about how the drug culture was born. Torgoff has written the first authentic history of how drugs became part of American culture." As he gathered the material for his previous book, CAN'T FIND MY WAY HOME, Martin Torgoff became fascinated by the roots of the drug culture in America. He did a tremendous amount of research and writing on the period before 1945 but could only use a fraction of it for the book in a chapter that he called “Bop Apocalypse”--an image from Allen Ginsberg’s epochal poem, Howl. Feeling that he’d barely scratched the surface, he wanted to go all the way back to 1910, when marijuana first arrived on the streets of New Orleans just as jazz was coalescing, and tell the story with a fully fleshed out cast of characters. This, at long last, is that book. As Can’t Find My Way Home told the story of how the use of illicit drugs went from the underground to a mass experience that one in four Americans have come to know, BOP APOCALYPSE: JAZZ, RACE, THE BEATS AND DRUGS tells the story of the underground itself--in essence, how the use of drugs entered the DNA of modern American popular culture in the first place. The narrative of BOP APOCALYPSE encompasses the birth of jazz in New Orleans, Harry Anslinger and the Federal Bureau of Narcotics, Louis Armstrong, the Chicago of the 1920s, Mezz Mezzrow and the tea pad culture of Harlem in the 1930s, the Marijuana Tax Act of 1937, the Savoy Ballroom, Kansas City and the birth of swing, Billie Holiday, Lester Young, Charlie Parker and the birth of be bop, the initial conjoining of the group of writers in New York that included Jack Kerouac, Allen Ginsberg, Neal Cassady and William Burroughs, the coming of heroin to the streets of Harlem, the addiction and fate of a generation of jazzmen and the impact of heroin on a whole community, the policies and popular attitudes surrounding addiction, the creation of the three jazz-imbued masterworks (On the Road, Howl, and Naked Lunch) that launched and defined the Beat Generation, and the advent, by 1960, of a new bohemian culture in cities and on college campuses across America. With topics like marijuana legalization, a new wave of heroin, and the gross racial disparities of mass incarceration all making headlines today, Bop Apocalypse takes the reader back to the time when the templates of modern drug law, policy, and culture were first established, along with the concomitant racial stereotypes. Back to the time when the whole culture war over the use of drugs in America first began. The book is a living history that teaches us much about the conflicts and questions that surround drugs today. Martin appears on Steve Provizer's Jazz Duplex Mystery Hour in Boston WZBC 90.3 FM,on December 28th 2017, discussing the book and playing music from an extensive song list.